You can put 3-5 books, computer or laptop up to 14 inches, ipad, mouse, battery charge, glasses, wallet, keys, earphone, power bank, cell phone, document and clothes in the bag. 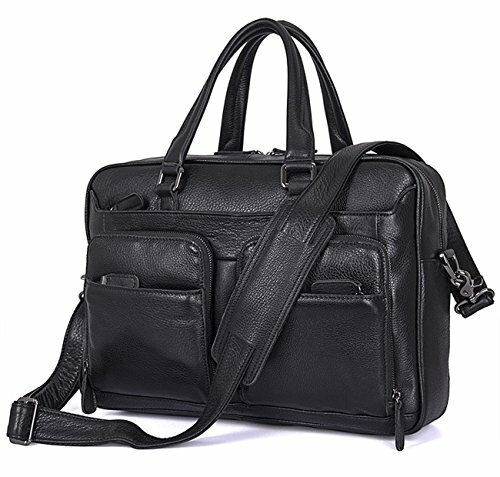 A successful man usually needs a Classic Black Briefcase which can be used in office, meeting, business travelling or daily life. Black Never be Out of Date!! - Since the size is measured by hand, the size of the actual item you received could be slightly different from the size above. - Since this item is made of genuine cowhide leather, you may notice a leather odor when you open the bag. Please completely open the package and put it in outside for a few hours and the smell will dissipate. ▶ 100% Guarantee genuine top layer cow leather. Vintage & Fashion Design, Livid tone hardware. Top zipper closure. ▶ Internal --1*main pocket , has 1*zipper pocket , 1*big sleeve with Velcro tap; External -- 4* zipper pockets(small pockets inside: 2*pen holders, 2*card bits and so on. ), 1*back side zipper pocket,1* back wall zipper pocket, Back exterior zipper pocket can hold IPAD AIR. Simple and generous design for business use. ▶ Please Note: Each naturally developed piece of leather is exquisitely unique, featuring its own distinct patinas and textures. With a detachable and adjustable shoulder strap!! ▶ Please Note: 1 YEAR QUALITY WARRANTY!!!! If you have any problem about the item, Please Do not hesitate to contact us. (Through the order ,you can find out : CONTACT SELLER) We will be there with you! If you have any questions about this product by Berchirly, contact us by completing and submitting the form below. If you are looking for a specif part number, please include it with your message.